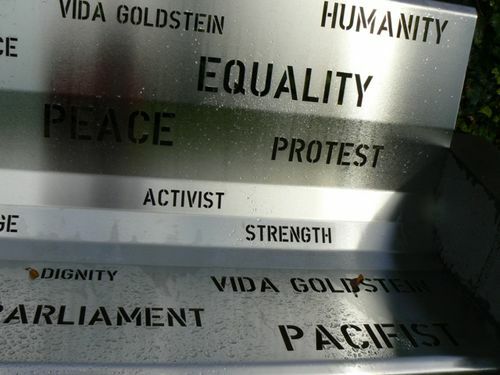 A seat commemorates Vida Goldstein, a Victorian social reformer (1869-1949) who was born in Portland. The seat was unveiled during the centenary of women`s right to vote in Victoria. Vida Jane Mary Goldstein (1869 –1949) was an Australian suffragette and social reformer. She was one of four female candidates at the 1903 federal elction, the first at which women were eligible to stand. Goldstein was born in Portland, Victoria. Goldstein followed her mother into the women's suffrage movement and soon became one of its leaders, becoming known both for her public speaking and as an editor of pro-suffrage publications. Despite her efforts, Victoria was the last Australian state to implement equal voting rights, with women not granted the right to vote until 1908. Throughout the World War One she was an ardent pacifist, became chairman of the Peace Alliance and formed the Women`s Peace Army. She recruited Adela Pankhurst, recently arrived from England as an organiser. Pankhurst wrote "Put up the Sword" and was gaoled for her radical activities. After the war Vida took an increasing interest in international matters. She advocated disarmament and the pursuit of better living standards. Although she often proposed simple solutions to complex problems, she was recognised as a born reformer, and as a devoted and courageous woman.